"I was in a very large well lit room with wall to wall bookcases full of books and important looking documents. There was a small group of men in the room who were explaining to me the plans, processes and history of the elite. They began to methodically explain to me how they were behind most of the important events that have historically transpired on the face of the earth. I was shown several maps and information recorded on strange looking documents. As I was listening to them share many of these things, I was astounded at the brilliance and wisdom of their plans and methods which they have used over the centuries to bring about their evil goals. Their desire is that their evil works always remain hidden and not be exposed. They wish to remain in the shadows doing their evil work from behind the scenes planning, controlling, murdering, deceiving, threatening, manipulating and creating chaos whenever and wherever they can. They are the seed of the evil one. Totally evil beyond description. I was shown with great detail how they have cunningly devised and manipulated world events, as well as events here in America, to achieve their ultimate goal of total world power and control. I was also shown how the seed of the evil one has countless times in the past concocted behind closed doors, their evil plans to try to destroy, exterminate and commit genocide on the righteous seed of our Father and how they have failed every time. They are sickly, demonic beings whose only aim is the destruction of the ways of the Creator, His Earth and His people. The LORD was always one step ahead of them, no matter how brilliant and wise their plans were; He was always one step ahead of them. 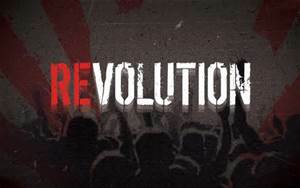 As I was watching all the things that were being shown to me and intently listening to what I was being told, one of the men approached me and said to me in a loud voice: 'There is going to be a revolution in America; it will usher in the New World Order'. As soon as I heard this, I was awakened. I was quite startled by what I had just heard. Many pieces of the puzzle began to come together and somehow things started to make sense to me. There seems to be urgency in heaven about this. The elite are going to try to start a revolution in America, and provoke the American people to buy into it. The Communists and Islamic Jihadists already placed deep in strategic places in the government throughout the Nation will try to ignite a revolution by baiting the American people to buy into it so they can destroy them. The American people must not take the bait, but rather expose it for what it really is and expose them for what they are doing. The Truth will always prevail over a lie; Light will always overcome darkness. I was told to warn the American people not to get caught up in such a conflict. If the American people were to take the bait and join in the revolution, they will play right into their hands as this is precisely what the elite wants, in order to declare Martial Law and usher in their NWO agenda to try to exterminate once again the righteous seed of the Father. The people must exercise self control and resist the temptation to fight this battle in the flesh. Rather, they must seek the Lord with all their hearts in true repentance and prayer. This is a spiritual battle that cannot be won in the flesh, but only in the spirit. This vision was given to me before the recent election in America, the Sandy Hook shootings and gun controversy, when many people considered the idea of a revolution style conflict happening in America farfetched. Now however, there seems to be much talk about it everywhere. I am very concerned that many Christians are being driven to anger that will result in much grief. The LORD is the only one who can and will deliver His people. He is the King of Heaven who has never lost a war. He is the only way to salvation. Turn to Him in repentance now, and ask Him to save you and wash you from all sins. Daniel 2:21-23 "And he changes the times and the seasons: he removes kings, and sets up kings: he gives wisdom unto the wise, and knowledge to them that know understanding: He reveals the deep and secret things: he knows what is in the darkness, and the light dwells with him. I thank you, and praise you, O God of my fathers, who has given me wisdom and might, and has made known unto me now what we desired of you: for you have now made known unto us the king's matter." Ephesians 5:12-16 "For it is a shame even to speak of those things which are done of them in secret. But all things that are reproved are made manifest by the light: for whatsoever does make manifest is light. Therefore he says, Awake you that sleep, and arise from the dead, and Christ shall give you light. See then that you walk carefully, not as fools, but as wise; redeeming the time, because the days are evil."